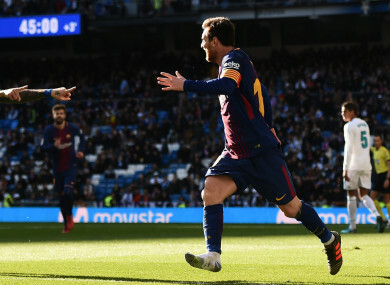 LIONEL MESSI INSPIRED Barcelona to a thumping 3-0 Clasico victory over Real Madrid, and even assisted his side’s third goal without wearing his right boot! Messi outstripped Marcelo for pace, reached the by-line and cut the ball back for Aleix Vidal to score Barcelona’s third in injury time, but it became clear during the celebrations that the Argentine maestro had done it all without the proper footwear. Messi lost his boot as he rode the challenge of Marcelo, before he crossed with his left foot, as Vidal added some gloss to a convincing scoreline. Luis Suarez scored Barca’s first, and Messi added a second from the penalty spot after Dani Carvajal was sent off for handling the ball on the line. Barca now sit 14 points clear of Real, who are fourth, and nine ahead of second-placed Atletico. Email “Watch: Lionel Messi assists third Barcelona goal with only one boot on”. Feedback on “Watch: Lionel Messi assists third Barcelona goal with only one boot on”.